With ever-improving standards in Quality Control, measuring the oxygen level around welds before, during and after welding reactive metals is crucial. The hand-held PurgEye 200 from Huntingdon Fusion is a Weld Purging Monitor specifically developed and designed for use when welding titanium, zirconium, high specification stainless steel and nickel alloy joints, so that the user can produce metallurgically sound and oxide-free welds. It is equipped with PurgeNet, allowing accessories to be connected. These include an automatic welding machine interface so that the oxygen level in the vicinity of the weld can be continuously monitored and the welding machine can be switched on or off according to pre-set oxygen levels, an external audible and visual warning devices and a dew point monitor. It has an OLED (organic light emitting diode) display, with sharp readings for viewing at distances and wide angles. These OLED displays are mainly symbol, rather than text based, making the menus internationally comprehensible. This instrument is able to operate from rechargeable batteries or mains power. 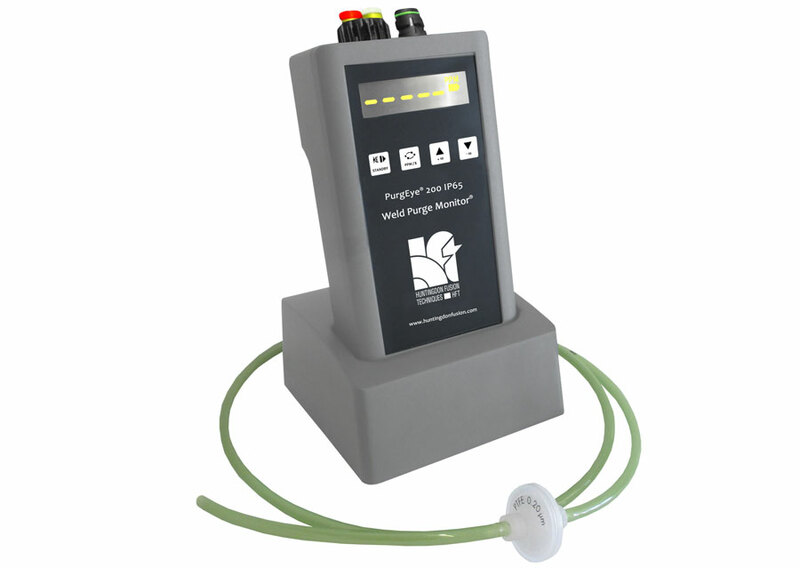 Along with loud, pre-settable audio alarms for rising or falling oxygen levels, the PurgEye 200 comes complete with a faster response long life sensor and integral electro-mechanical pump to extract samples from a weld purge zone, in the event that there is insufficient flow rate or positive pressure to activate the sensor correctly. It reads down to 1 ppm (very accurate as far down as 10 ppm). It is IP65 rated, which means it can be used in very demanding areas where instruments are used on site, such as in desert or tropical conditions. PurgeLog Software is provided to record Weld Purging results and provides quality control documents for each weld.